Die neue Mehrwertsteuer fördere „Ehrlichkeit und Menschen, die ehrliche Geschäfte machen“, sagt Indiens Premierminister Narendra Modi. In Indien ist am Samstag die größte Steuerreform seit der Unabhängigkeit im Jahr 1947 in Kraft getreten. Die neue einheitliche Mehrwertsteuer GST ersetzt unterschiedliche Steuern und Steuersätze in den 29 indischen Unionsstaaten. Damit entsteht auf dem Subkontinent mit seinen 1,3 Milliarden Einwohnern ein riesiger Binnenmarkt. Premierminister Narendra Modi will mit der Steuerreform zudem den Handel erleichtern und die Wirtschaft modernisieren. In einer Sondersitzung des Parlaments um Mitternacht versprach Modi den Indern „eine gute und einfache Steuer“. Mit der neuen einheitlichen Steuer für Waren und Dienstleistungen werde „der Traum von einem Indien wahr“. Das „einfache und transparente System“ bekämpfe auch Schwarzgeld und Korruption. Die neue Mehrwertsteuer fördere „Ehrlichkeit und Menschen, die ehrliche Geschäfte machen“, sagte Modi. Mehr als zehn Jahre lang hatten die Regierung in Neu-Delhi und die Unionsstaaten über die Vereinheitlichung der Steuersätze verhandelt. Das bisherige System war undurchsichtig, teilweise bestanden von Unionsstaat zu Unionsstaat erhebliche Unterschiede. Lastwagen mussten oft stundenlang an den Grenzen warten und bei der Wareneinfuhr die regional geltenden Steuersätze nachbezahlen. Indiens Premier Narendra Modi hat in einer spektakulären Rede (Englisch ab Minute 37:44) bekanntgegeben, dass Geldscheine für 500 und 1000 Rupien (7,50 Dollar und 15 Dollar) ab sofort abgeschafft werden. An Geldautomaten dürfen zahlreiche Bürger nur noch bis zu 3000 Rupien (30 Dollar) anheben. Die Geldscheine verlieren am Mittwoch ihre Gültigkeit, das heißt also mit sofortiger Wirkung. Am 9. November wird es einen Bankenfeiertag geben, die Banken bleiben geschlossen. Die Verwendung von Kreditkarten soll durch die radikale Maßnahme nicht beeinträchtigt werden, sagte Modi. Die Möglichkeit, mit Karten an Tankstellen zu bezahlen, solle weiter gegeben sein, sagte Modi. India’s bid to become the ‘economic super-tiger’ of Asia is in serious doubt after an assault on the independence of the central bank and failure to deliver on promised reforms. The country has been the darling of the emerging market universe since the Hindu nationalist Narendra Modi swept into power in May 2014 promising a blitz of Thatcherite reform and a bonfire of the diktats, but key changes have been blocked in the legislature. The government has turned increasingly populist. 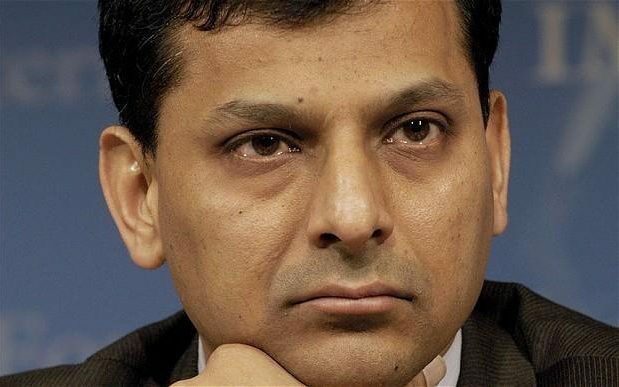 Matters have come to a head with the de facto ouster of Raghuram Rajan, the superstar governor of the Reserve Bank of India (RBI), rebuked for keeping monetary policy too tight. It is part of a pattern of attacks on central banks by politicians across the world, and the latest sign that the glory days of the monetary overlords are waning. Indian manufacturing peaked in the mid-1990s. Can its decline be reversed? INDIA is not the place most people would expect to find precision engineering. Yet Guillaume Capato is on the shop floor of the Mahindra Aerospace factory, an hour’s drive from Bangalore, explaining the complexity of an aluminium halter, used to reinforce the fuselage on a jet aircraft. Formed from a single piece of metal into a U-shape using a press, each side is of a different size and shape and drilled with holes of varying dimensions so that the part will precisely match all the other bolt holes around it. The halter is accurate to an exacting degree: it only makes sense to add weight to an aircraft’s structure if it also adds strength. That principle is lost in India, where the weight of regulation has sapped the strength of manufacturing. A YEAR ago Narendra Modi came to office promising to bring India “good times”, by which he meant jobs, prosperity and international renown. His progress has been frustratingly slow. The problem is hardly a lack of opportunity. Voters gave his Bharatiya Janata Party (BJP) the biggest parliamentary mandate for change in 30 years. Mr Modi has concentrated more power in his own hands than any prime minister in recent memory. The problem is that India needs a transformation—and the task is too much for a one-man band. To the unrestrained delight of investors and financial markets, Narendra Modi has prevailed in the audition for India’s newest Messiah. The incumbent has been received rapturously, with commentators running out of superlatives and comparisons – Thatcher, Reagan and several Indian gods. Indian stocks, up over one-third since September 2013, and the rupee, up about 15 per cent over the same period, have a lot of good news built in to the price. The conservative Bharatiya Janata Party’s (“BJP”) convincing victory saw it gain a rare majority in its own right, winning 282 out of 543 seats in the lower house (the Lok Shoba). In conjunction with its allies, the BJP will control around 333 seats (61% of the legislature), an unprecedentedly comfortable majority in India’s generally fractious coalition politics. The win was based on appeals to Hindu chauvinism and the young, increasingly urban classes (India’s ‘selfies’). The electorate was tired of corruption, lack of progress, incompetent leadership and resistant to the perpetuation of the Nehru/ Gandhi “sexually transmitted democracy” (a phrase coined by writer William Dalrymple). A tired, ineffective and dysfunctional Congress led government had conceded defeat a long time ago, unwilling to waste political capital in what they saw as a lost battle.